Despite that fact that the US has been somewhat slow on job market recovery, and China has been slow on overall growth, Europe and Japan seem on the track of steeping out of the woods. Low crude oil prices have helped fuel Taiwan’s domestic growth with respect to stabilizing global conditions. 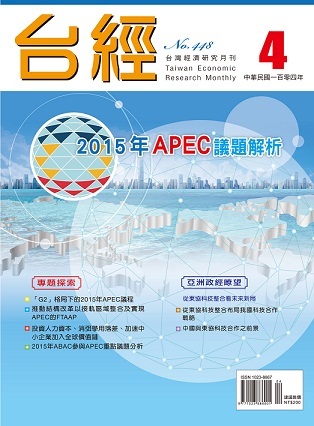 The Taiwan Institute of Economic Research (TIER) slightly adjusts its annual forecast for 2015 upward by o.o3 percentage points to be 3.70%. Taiwan’s exports in March 2015 decreased by 8.88% on a year-on-year basis; the continuous crude price plunge offsets the exports of petroleum related industries. As Taiwan’s imports would often be affected by exports, the imports in February 2015 also declined by 17.75% year-on-year due to almost the same reasons of declining exports. In response to the “The Beijing Roadmap for APEC’s Contribution to the Realization of the FTAAP “, which was announced by the 2014 APEC Leaders, urging that APEC economies to promote FTAAP's progress. Meanwhile, the Friends of the Chair Group on Strengthening Regional Economic Integration and Advancing, under the Committee on Trade and Investment, would form a task force in 2015, aiming to engage in a common strategic study of FTAAP, in accordance with the wishes of APEC efforts to promote FTAAP. A through analysis on potential impacts would be necessary with respect to the launch of FTAAP study.